Nothing sells your services better than good marketing. A well-designed website can do wonders for your bottom line. I have been designing and maintaining websites since 2004. 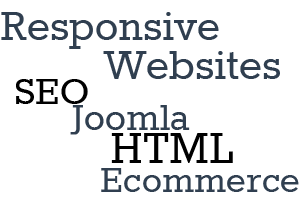 I specialize in HTML sites, as well as CMS platforms such as Joomla! and basic WordPress. I primarily design in Joomla, but am able to offer simple WordPress sites, as well. QR codes and graphic design are also on the list of services. If you are in need of a new site, a redesign, or just someone to maintain your site for you, please visit the Contact Me! page to email me or request an estimate.